Listening to music while practicing yoga is more of a controversial idea than you might expect. For some people, it just seems to work; for others, it’s a distraction. What’s most important is to select music that you enjoy listening to and music which serves the purpose you’re trying to achieve. One of the most beneficial effects of almost all types of music is to enhance movement. When practising, some postures can feel difficult or uncomfortable, especially while you’re in the early stages of learning yoga. Listening to music can increase the sense of grace and ease which is sought, easing transitions between postures and improving the physical benefits. Listening to music while practicing yoga can also help us to relax and not strain. This is important. Yoga is about doing our best while we relax and not comparing ourselves with others. Becoming more relaxed with music is an ideal way to do this. ‘Meditation music’ has become surprisingly popular. Surprising because traditionally, music is a distraction which has no place in meditation. Certainly methods which focus on mantras and on breathing are only interrupted by music but the most popular form of meditation in the West (‘mindfulness’) is totally compatible with music. Certainly prior to all forms of meditation it’s good to relax and music is ideal for enabling us to become calm. Clearly meditation and yoga are different practices but they’re both related and the impact of different musical qualities is similar in terms of helping us to relax. 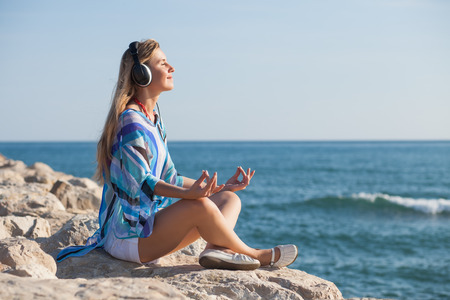 Music can be used as a backdrop which adds context to one’s thoughts and feelings, for example by creating a positive mood and helping us to move past emotional obstacles to mindfulness. Just as when we listen to the sound of a gong, we transcend our thoughts to a state of inner peace. Musical variation is the repetition of parts of a piece of music in a different form, for example with melody or rhythm altered but the bar or phrase is recognisable as something we’ve already heard. Variation tends to increase the extent to which music is ‘interesting,’ giving us more to think about, more to notice. Variation can be insistent; we expect to hear a certain melody repeated and the subtle difference draws our attention. This can make highly varied music distracting when we’re trying to achieve a state of peace and relaxation. So the selection of sacred music tends to be conservative in its variation; designed more to soothe and exalt and not “jump out” at a listener. With less potential for distraction and more consistency, sacred music can be perfect for both yoga and meditation. Tempo is also a major factor. A bit more self-explanatory than variation, higher tempo creates a sense of energy, excitement and urgency while lower tempo creates a sense of peace and relaxation. Not all meditation, nor all yoga aims at relaxation but it’s a great place to start and is greatly eased by the introduction of pleasant distractions. The level of content in a piece of music (the feeling of ‘busyness’) does have an impact, with sparser compositions being more valuable in clearing the mind. It seems fairly intuitive that we’d look for fairly minimal music for meditation to reduce distraction but many people find that very simple or ambient music can be more rather than less distracting, especially if the listener wouldn’t normally choose to listen to it. Picking a balance between interest and subtlety, choosing a piece of music on the basis that it might help you achieve the particular state rather than hoping that it might aid your meditation or yoga in general, is the best way to maximise the benefits. Every spiritual tradition is different on the surface. But most spiritual music is concerned either with clearing the mind of unwanted tendencies and cultivating its positive tendencies, by awakening an awareness of and connection to divinity or by refining one’s emotions. Substitute ‘Self’, as in the higher Self, for divinity and sacred music could almost be purpose-built for yoga and meditation. Music can be used (by some people) to enhance meditation but may be more valuable for most people as meditation. As a background, music provides things like emotional bias which could either be considered good, for its power to create a good mood without a strong positive context, or bad because of the way it distracts you from finding a source of happiness within yourself. As a foreground, music can function more like a mantra; providing a content which the mind can focus on in order to edge out other distractions for the purposes of contemplation and reflection. Music can actively improve our ability to reflect, as it enhances memory. There are as many types of sacred music as there are spiritual traditions in the world. Music is such a part of being human that every tradition (indeed, almost every human group) has developed their own style. On Sacred Music Radio we play music from all traditions and from performers with no particular affiliation. If you’re looking for something new to enhance your yoga or meditation, or even a way to relax prior to meditation and you’ve never considered playing some background music (or sitting with headphones, hearing every note and every instrument dance together in the darkness behind your eyelids), you might be pleasantly surprised by the results… I’ve yet to meet a person who doesn’t enjoy music. In 1979 I participated in a meditation retreat led by Pir Vilayat Khan. I was inspired by the inclusive interfaith principles of Pir Vilayat’s universalist teachings. I created Sacred Music Radio with the intention of enabling us all to experience the incredible variety of sacred music from around the world. I have practiced yoga for seventeen years and meditation for forty years.